Last week was very good to Republicans not just because they claimed the White House and kept control of Congress but also because they reached a high watermark in state capitols around the country. 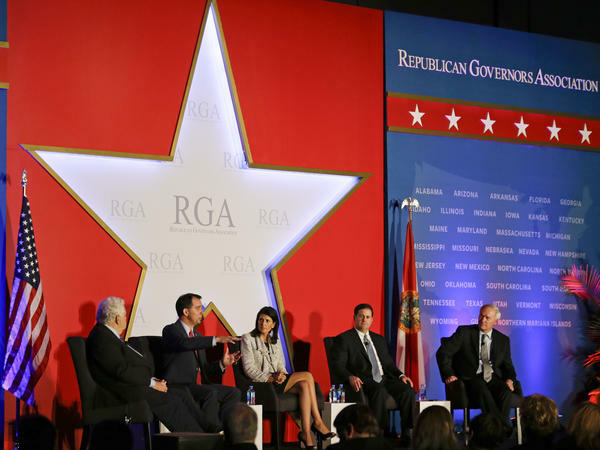 Soon, 33 of the nation's governors will be Republicans, the most in nearly a century. Many of them are meeting this week in Orlando, including some who did not support Trump in the presidential campaign. But as NPR's Greg Allen reports, that is all in the past. GREG ALLEN, BYLINE: For Republican governors, this week's meeting is something of a victory lap even for those who had strong reservations about Donald Trump, like South Carolina's Nikki Haley. NIKKI HALEY: Get excited because I am just giddy. ALLEN: During the campaign, Haley criticized Trump's divisive rhetoric but eventually supported him. This week she said words matter and that she's still watching Trump's comments. ALLEN: That was in response to a question at a news conference. Republican governors have done their best this week to avoid commenting on the president-elect or the controversy swirling around his transition team. Republican governors all say they have a lot of confidence in Vice President-elect Mike Pence, the man leading Trump's transition, in part because the Indiana governor is one of their own. Pence met with the governors here in Orlando Monday. Tennessee Governor Bill Haslam says Pence talked with them about health care reform, spending on infrastructure and business tax cuts. Haslam is one of many Republicans who refused to endorse Trump, at one point calling on him to step down in favor of Pence. But Haslam said, now it's all good. BILL HASLAM: Each one of us as governors, even those who maybe weren't, you know, leading the cheers for a president like Trump - all of us realize that we're in a better place as governors with Trump being president than we would have been with Hillary. ALLEN: Besides winning more governors' seats, Wisconsin's Scott Walker pointed out Republicans also made significant gains in state legislatures. With a Republican Congress and president, he said, the sky's the limit. Walker thinks President Trump and a Republican Congress will be open to delegating more power to the states and returning more federal money in the form of block grants. SCOTT WALKER: President-elect Trump believes overwhelmingly that good chunks of what now are the responsibility of the federal government belong with the states and inherently, more importantly, with the people. ALLEN: Republican governors say block grants could work for Medicaid and for a Republican replacement for Obamacare. The governors support Trump's pledge to repeal and replace the Affordable Care Act. But Florida Governor Rick Scott warned it won't be easy. RICK SCOTT: The empire will strike back. The people that make money off the existing system, the people that don't want change - they're plotting every day to try to stop what we know we have to do to turn this country around. ALLEN: Scott is one of the governors most outspoken in his opposition to Obamacare. Others like Tennessee's Bill Haslam and New Mexico Governor Susana Martinez embraced some parts of the law and expanded Medicaid in their states. Martinez says it's important that a comprehensive Republican alternative plan be ready before Obamacare is repealed. SUSANA MARTINEZ: There's going to have to be a transition and never leave everyone uninsured. ALLEN: On replacing Obamacare, Arkansas Governor Asa Hutchinson injected a little personal political realism into the discussion. Hutchinson said Trump and congressional Republicans need to take a thoughtful approach in how they deal with mandates and health care exchanges, key parts of a program that provides coverage for some 20 million Americans. ASA HUTCHINSON: These are things that we now have an opportunity to revisit. But we have to get it right because in 2018, I'm up for reelection again. ALLEN: Republican governors all say they look forward to Trump's expected repeal of executive orders signed by President Obama, rolling back some environmental and labor regulations. But Hutchinson says Trump has another important task in his first 100 days - giving assurances to U.S. allies and building confidence in his leadership around the world. Greg Allen, NPR News, Orlando. Transcript provided by NPR, Copyright NPR. President-elect Donald Trump has picked former Wisconsin Republican Party chair Reince Priebus as chief of staff. House Speaker Paul Ryan appears poised to maintain his position. And Gov. Scott Walker has just become chairman of the Republican Governors Association. The three are close, they share an ideology, and they’ve risen to prominence at about the same time. WUWM wondered about their impact nationally, including on Trump's victory in Wisconsin. It was the first for the party in decades.